Please see the note below explaining how these graphs were made. The super short version: each winter was plotted by how much it differed from the normal for average temperature and snowfall. The blue shaded areas represent a "usual" range for each measure. If a winter is outside those area, it's probably safe to say it was "unusual" in that regard. This is the same graph, but animated to show groups of winters by period (usually 25 years). This graph highlights what you might call the "weird" winters. These are winters that were outside the usual range in some way for both average temperature or snowfall. For example, the 2015-2016 winter was both unusually warm and unusually snowy (see it down there in the lower right quadrant). This post is mostly some graphs. They're in large format at the top of the page -- click or scroll all the way up. Admittedly, those are blunt measures that will smooth over some extreme events. But they're an easy way of comparing across many years. For each winter we calculated how much that winter's average temperature and snowfall total differed on percentage basis from the current 30-year normals (1981-2010) for each measure -- 26 degrees for temperature (as calculated in the NOAA's output) and 60.3 inches for snowfall. Then we plotted each winter on a graph according to how it compared to those normals. One more thing about the graphs: They include blue shaded areas for temperature and snowfall. Those represent what you might consider the "usual" range for those measures. (To be more specific, they represent one standard deviation for each measure.) We added those ranges to have a sense of which winters really were unusual and not just a little high or low for some measure. There's a reason it seemed weird -- because it really, really was. 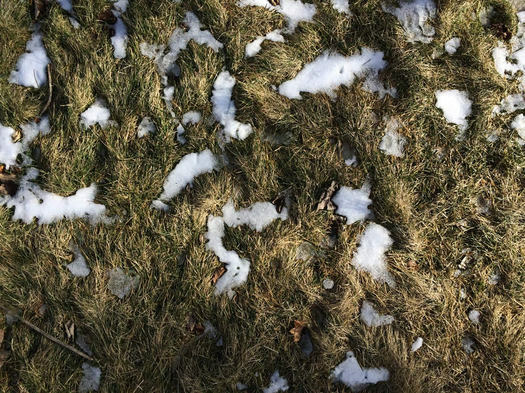 It's an outlier among outliers for both temperature (very warm) and snow (very little). As mentioned above, the blue shaded areas indicate what you might consider the typical ranges for average temperature and snowfall for a winter. So winters that fall outside those ranges for a measure could be considered unusual. And winters that fall outside the range both measures could be considered... weird. Figured that way, there have been 13 "weird" winters in the last 121 years. And three of those have come in the last 15 years -- 2015-2016 (not cold and not snowy), 2011-2012 (not cold and not snowy), and 2002-2013 (cold and snowy). This whole analysis is squishy, but let's make it even squishier by creating a "weirdness" score for each winter by adding together how much each winter was different from the normal in both temperature and snowfall. By doing that, we can rank the winters by overall weirdness (so very much not a technical term). 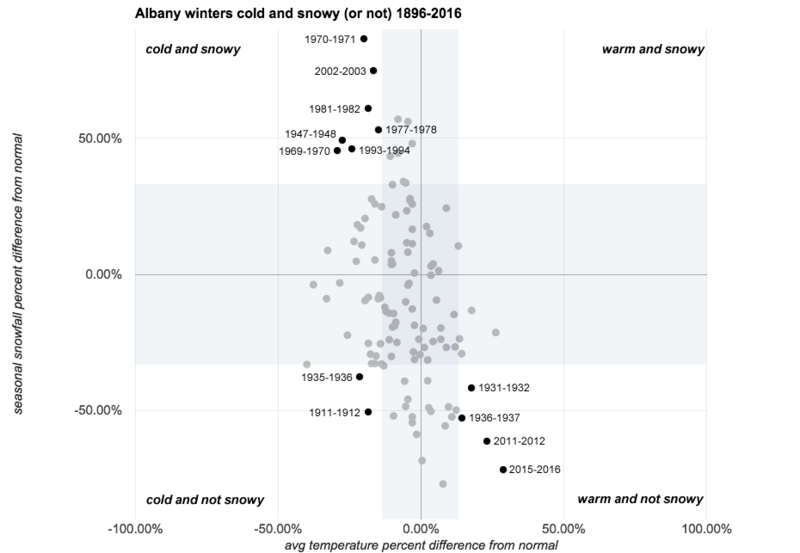 And when we do that, 2015-2016 ranks as the #2 weirdest weather on record for Albany -- behind only 1970-1971 and it's crazy record-high snowfall total (112.5 inches) and unusually cold temps. As it happens, the three "weird" winters of the last 15 years all rank in the top 5 all-time in this ranking. 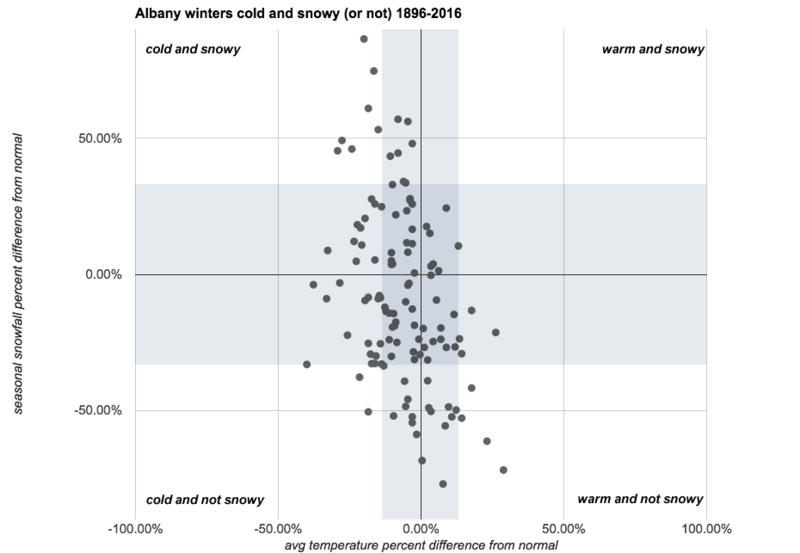 There's a bonus graph above about how the average winter temperature has changed over time in Albany. It's been warming by 0.3 degrees per decade over the last 120some years, according to the NOAA data. That's not surprising. 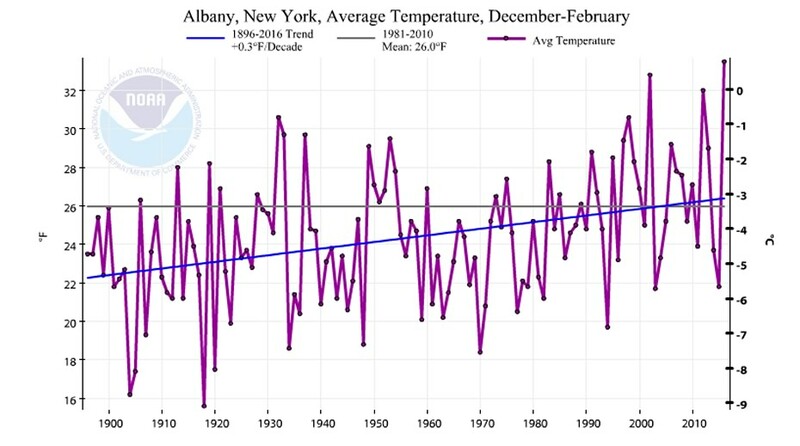 The average annual temperature in New York State has been on a similar rise over the same period. It's up more than 1 degree Fahrenheit during that time. Climate change, rising oceans, wasn't this past August the warmest on record? I'm not sure the hallmark of science is "always forever questioning everything" so much as a careful methodology for determining facts from speculations. Like, for example, analyzing the consensus of climate scientists vs. anecdotes attesting to the opinions of "barristers at coffee shops." I'm sure there are many fine barristers there, but I'm not sure they're qualified to weigh in (or make my coffee). Perhaps we all should pray to somebody else...Joe Pesci?